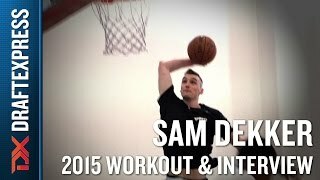 An interview with Wisconsin's Sam Dekker, featuring footage from his pre-draft workouts in Chicago. Interview and video footage courtesy of Tad Hathaway of 312 Media. -Sam Dekker: The Wisconsin forward measured 6'7.75 without shoes, which matches the height he posted last summer when his growth was a point of interest. He's lost 10 pounds since then, which is interesting considering he wasn't carrying much extra weight on his frame. at 219 points with just a 7.5% body fat percentage, he has plenty of room on his frame to continue to add bulk, which he certainly will at the NBA level. A highly regarded prospect prior to college (#13 RSCI), Sam Dekker became only the second Top-25 recruit to commit to Wisconsin since Bo Ryan became head coach in 2001. He likely would have been a first round pick after either his freshman or sophomore year, but elected to return for his junior season, and was rewarded for that with a long run to the NCAA Tournament Championship game, which he played a huge role in. Dekker has great physical tools for a NBA small forward, starting with excellent size 6-9, a very good frame (weighed at 229 pounds) and strong athletic ability. He is fluid and mobile with good quickness and the ability to play above the rim with relative ease. The only area where he doesn't stand out in as in terms of his wingspan, which measured only 6-10 at the Nike Skills Academy this past summer. One of the most versatile and efficient offensive players in the college game, Dekker does a little bit of everything, even if he doesn't truly excel in any one area. He is good in transition, can attack his man off the dribble, moves off the ball intelligently, crashes the offensive glass, and can make an open jumper, giving him many different ways he can contribute to a NBA team early on in his career. Dekker's size, athleticism and versatility shines through most vividly in the open floor, where he is very effective grabbing a rebound and going coast to coast as the ball-handler. He didn't get as much of a chance to show this part of his game at Wisconsin (one of the slowest paced teams in the NCAA) as he will in the more up-tempo settings of the NBA, but he clearly can. Dekker's size, quickness and timing as a slasher also benefited him in the half-court, where he was capable of attacking defenders driving in both directions thanks to his strong first step. He's mostly a straight-line driver, which makes him more effective from 17 feet and in than from beyond the 3-point line, but he should be able to find some mismatches to exploit his quickness, particularly when utilized as a face-up power forward, which he can do at his size. Cognizant of staying in his lane and not trying to do too much (a necessity in Wisconsin's offense), Dekker almost never turned the ball over, coughing it up on just 7.3% of his possessions this season, the lowest rate of anyone in our Top-100 rankings. Only four players in the history of our collegiate stats database (dating back to 2002) have been drafted after posting a lower turnover percentage than Dekker did this seasonRobbie Hummel, Matt Freije, Marcus Denmon and Jon Leuer. On a similar note, Dekker does a nice job of taking what the defense gives him, as he can punish smaller players in the post with his solid frame, nice footwork and good quickness, and also moves off the ball intelligently, finding open spaces to cut into for easy baskets. He's the type of player who doesn't need plays called for him and won't have much of a transition to make to being a role-player in the NBA, as evidenced by his relatively modest usage rate (23%) and excellent efficiency (61% TS%). He also contributes as an offensive rebounder, grabbing 2.7 per-40 minutes, the fourth best rate among DX Top-100 small forwards. Defensively, Dekker is similarly versatile, being capable of guarding bigger players with his size, strength and toughness, and smaller players thanks to his solid lateral quickness and strong effort level. He should be able to switch seamlessly between shooting guards, small forwards and power forwards in pick and roll situations, which is attractive in today's NBA. He's the type of player who doesn't back down on this end of the floor, as you'll regularly see him taking charges and throwing his body around, showing a nice competitive streak. The biggest question Dekker will face as he transitions to the NBA is his consistency as an outside shooter. He made 34.8% of his 3-point attempts for his Wisconsin career, starting his career shooting 39% as a freshman, but declining the following two seasons as his role increased. He also shot just 69.5% from the free throw line over the course of his career, which stayed consistent all three seasons. Dekker is not a non-shooter, as he proved capable of making open shots from the perimeter from time to time (1.3 per game on average), both with his feet set and off the dribble, and got very hot on occasion, as he showed in the NCAA Tournament. He just wasn't consistent and didn't show the type of improvement in his shooting form as you might hope, as his mechanics are not fluid or pretty, and he tends to fling the ball at the basket with poor balance and excessive arc on his shot, resulting in some very ugly misses at times. He's also not the most advanced ball-handler around, as he's mostly a straight-line driver who uses spin moves and subtle change of speeds, but is nevertheless not the most creative guy around, as evidenced by his extremely low assist percentage (8.6%), which ranks as the second lowest rate among non-big men in our Top-100. Wisconsin rarely looked for him to emerge as a prolific pick and roll or isolation player, as that's not their style of play, but regardless doesn't appear to be his biggest strength as a prospect at the moment from the film we do have at our disposal. Additionally, his short wingspan may make it difficult to finish some of the plays he does create around the basket in traffic in half-court settings. Although unlikely to emerge as a star, Dekker has everything you look for in an outstanding role-player, and his size, athleticism and versatility combine for a coveted package of skills in the style of play we're seeing in the NBA these days. His ability to become a consistent shooter at the NBA level will be a huge key for his career, and will likely determine just how valuable a player he develops into long term. Mike Schmitz is the video analyst for DraftExpress. Follow him on twitter and check out the DraftExpress video section. He will be breaking down the NBA draft in digital format all year long for us. A smart and versatile combo forward with good size, length and mobility, Sam Dekker (#35 Scout, #18 Rivals, #26 ESPN) is the type of player any college coach would love to have in their rotation. Capable of scoring elegantly in transition or with catch and shoot jumpers in the half-court, Dekker is a mature player with good timing and a nice feel for the game. He moves off the ball well, is a solid passer and puts a good effort in defensively, even if his lateral quickness might hamper him against certain matchups he faces at the three spot. Dekker is a bit stuck in between positions and might see some time as a face-up 4 early on in Bo Ryan's offense, which won't be an issue considering his toughness and activity level. His skill-level is good for his age but will he'll need to continue to refine his ball-skills as the competition stiffens, as well as work on his body.